Students will create a double self-portrait, an image of themselves made with their one-of-a-kind fingerprint! I love to do this project after I have taught value scales and allow students a chance to study value in a unique way. It is also a great project for teaching to draw and paint using the grid technique. I have done this project with grade sixes, however I provided them with a photocopy of their school photo with a grid already printed. I also give them a larger sheet of paper printed with a grid with the same number of squares. For older grades, they could practice creating their own and work with scale and enlargements. 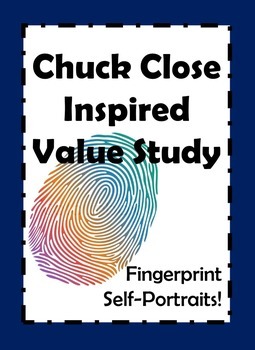 This resource includes a brief history on the artist, Chuck Close and images of some of his fingerprint work. He is very relatable to students as he suffered throughout his life with various illness and learning disabilities. It also includes images of my students working on their projects and a completed self portrait.